The area was a German colony from the 1880s to 1919, then became a British trust territory from 1919 to 1961. Julius Nyerere became Minister of British-administered Tanganyika in 1960, and continued as Prime Minister when Tanganyika became independent in 1961. Tanganyika and Zanzibar (which had become independent in 1963) merged to form the nation of Tanzania on April 26, 1964. Nyerere introduced a form of African socialism termed Ujama, which emphasized justice and equality, but proved economically disastrous, leading to food shortages as collective farms failed. In 1979, Tanzania declared war on Uganda after Uganda invaded and tried to annex Tanzanian territory in the north of the country. Tanzania not only expelled Ugandan forces, but also invaded Uganda itself, forcing the ousting of Idi Amin. Nyerere handed over power to Ali Hassan Mwinyi in 1985, but retained control of the ruling party as Chairman until 1990, when he handed that responsibility to Mwinyi. One-party rule came to an end in October 1995 when Tanzania held its first ever multi-party election. Benjamin Mkapa was subsequently sworn in as the new president of the United Republic of Tanzania on 23 November 1995. 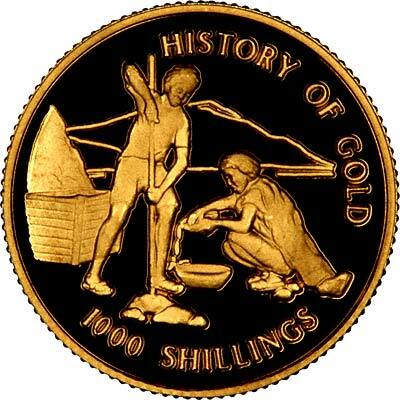 Tanzania only issued its own coins for the first time in 1966, and its gold coins are commemorative pieces. 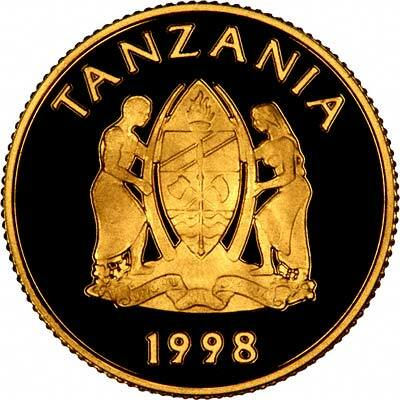 For silver and base metal coins of Tanzania, please look at our original Chard Coins website.